Hats off to the soundman of this show because all bands that played on this night had stellar sound. You were able to actually hear all vocals, guitars, etc., despite the extreme volume and at times blurring notes which were played in super fast metal/sludgy metal songs. I arrived in time to catch COC - Blind and incase you are living under a rock, COC - Blind is Reed & Karl from the “Blind” era of COC with 2 new guitarists. COC without Woody on guitar isn’t the same but the band did a solid job of covering the “Blind” era with “Dance of the Dead” being the best song of their set. The COC - Blind set featured a special guest....Vulvatron from Gwar joined them for “Vote with a Bullet” and immediately after that song they asked if anyone in the crowd could play bass? An audience member took the stage and they allowed him to play a 2 note punk song which lasted all of 90 seconds. COC - Blind sounded great and they were a hard act to follow. 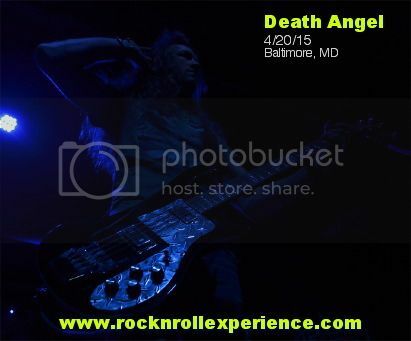 Death Angel brought their brand of San Fran Thrash to the tour and what struck me while watching them is that style is now considered “classic metal” because it’s what Testament, Metallica, Exodus, etc., all started. Comparing Death Angel to COC - Blind was interesting because COC - Blind had a larger crowd and are more of an amped up Black Sabbath whereas Death Angel are pure thrash metal and their guitar solo’s were more complex, and their songs were much faster. I was impressed that Death Angel played a 1 hour set because I’d never seen them do more than 35 minutes in an opening slot. 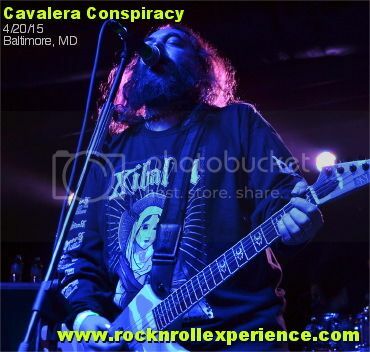 Cavalera Conspiracy were the nights featured act and the set list which was posted onstage was nothing more than a “list” of songs they would play because they didn’t stick to the set list order whatsoever! Posted on the bands merch table was a sign that read “Aftershow meet and greet with Max & Igor $100” and with that meet and greet you received a few goodies and were allowed pictures and autographs with the Sepultura brothers. Igor took the stage first and he’s looking very muscular and fit these days while Rizzo is still an absolute beast on guitar! Max was dead center onstage and he’s always done the same thing since day #1; he leads the crowd and band onstage with a brawny Brazilian toned voice that’s equal to his musical tone. 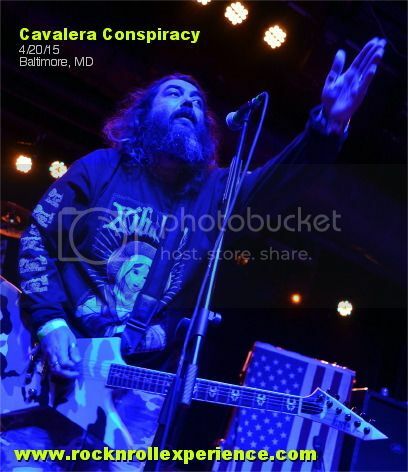 Cavalera Conspiracy reminds me more of Soulfly than Sepultura and it’s always nice to hear Max perform a Nailbomb cover as well! “Roots” was probably the fan favorite of the night but for me it was the cover of “Orgasmatron”! I was surprised that every band played a lengthy set which resulted in the show ending at 1 AM. This was a Monday night and I guarantee some people missed school/work the next morning and I will admit that I was just a tad bummed that the main bands never mentioned that it was 4/20!